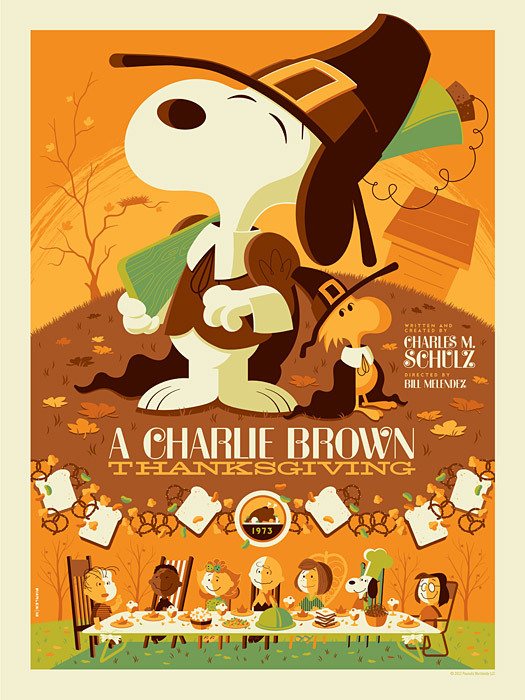 It's a good month for fans of Dark Hall Mansion's limited edition Peanuts prints. 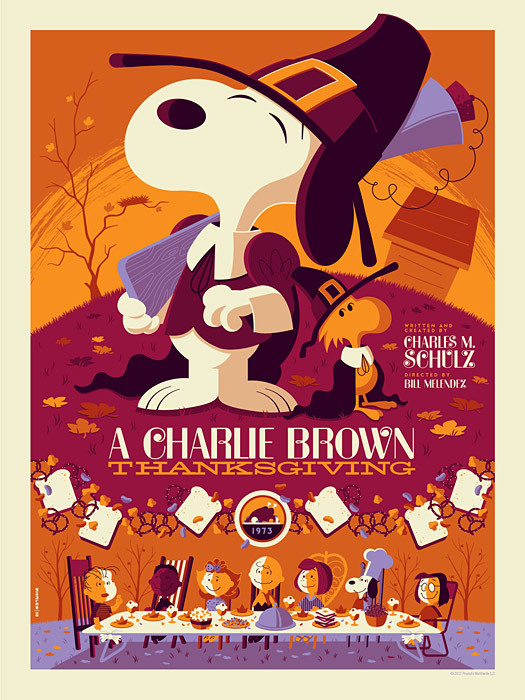 Hot on the heels of their 2012 Great Pumpkin prints, they've announced two great new prints commemorating the 1972 television special A Charlie Brown Thanksgiving. Drawn by Tom Whalen, the artwork is in the same style as his It's the Great Pumpkin, Charlie Brown and A Charlie Brown Christmas prints (sold by Dark Hall Mansion in 2011), so now collectors can have a matching set of Tom Whalen prints for all the three classic Peanuts holiday specials. 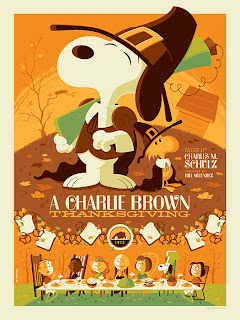 The Charlie Brown Thanksgiving prints showcase Snoopy and Woodstock in their pilgrim costumes, while the rest of the gang is gathered around the table for Charlie Brown's unique Thanksgiving dinner. The standard print is done in warm fall-colored tones, while the variant print uses a more eye-popping color palette. The two officially licensed editions are 18" x 24", numbered, hand-pulled screenprints. The standard edition is limited to 300 prints, and the variant is limited to 50 prints. Each style - standard and variant - will also have a special 15-print wood edition printed on 18" x 24" maple wood. The prints go on sale Tuesday, October 2, 2012 at 9:30 AM (Pacific time) at Dark Hall Mansion's webstore. Limited edition Peanuts prints from Dark Hall Mansion have been quick sellers, so don't hesitate with your order if you're interested. UPDATE: The prints are now sold out. As always, for more information and for larger pictures of the artwork, visit Dark Hall Mansion's blog, and visit their Facebook page for some behind-the-scenes photos.